Description: Thats right guys, we're moving and starting up again! We sincerely apologize for being gone so long, personal life can be a real hassle sometimes. We didn't like stopping, but it was something we had to do. Starting June 1st, you will be able to tune in to bi-weekly AmDrag fanfic podcasts at cyberlightproductions.com! But enough of that depressing stuff. Download our announcement! We are moving to a new home with a (mostly) new cast & crew at: cyberlightproductions.comWe will begin releasing collections of AmDrag one-shots on June 1st 2010!After June 1st we will air new story content every 2 weeks until JulyJuly 4th, 2010 is AmDrag Independence Day It will feature the first episode of Dragonfire, remastered with our all new Cast!Subsequent episodes will air every two weeks following July 4th. We promise.The feed will be changing, however, if you are currently subscribed, you should be automatically redirected. If you don't see something drop out of the feed on the 1st of June, please head over to cyberlightproductions.com and resubscribe. Join our cast! Visit cyberlightproductions.com and check out our list of Needed Characters. Then email mike@cyberlightproductions.comSubmit a story! Visit cyberlightproductions.com and click "Story Submissions" Read the rules and then email your story content to mike@cyberlightproductions.comWe look forward to seeing you with us on the new feed at Cyberlight! Well it's finally that time and we at STS are proud to bring you the first episode of Firestorm, Book One: Dragonfire! Sorry folks, no synopsis this time, wouldn't want to spoil the start for ya. Mike talks about the changes that have been going on over at savetheshows.com and the coming changes to its sister site, Fightforadjl.com as well as the forum going up at STS (forum.savetheshows.com). Be sure to check out the new user system and register, it will be well worth it soon. Expect Dragonfire Episode Two to run in about 3-4 weeks, we're giving our actors a little bit of a break while the college final exams take place. Can't make life to hectic, can we? I want to go ahead and tell you that this interview was recorded nearly 2 months ago and hence is somewhat outdated in the things we discuss....however for the most part all the things that you will hopefully enjoy are still current. My chatter before the interview starts was recorded only a few days ago so it is all current. Points of note: There is an ADJL rally/chat tonight at 7PM EST (thats 1 and a half hours from this posting). You can connect to this chat by going to the following link here. After the long wait since our last episode STS is proud to bring you the first true story content of the ADJL project! It is "Trouble with Physics" written by ArkansanDragon (the writer of "Dragonfire" to air in 2-3 weeks. There is some audio distortion at times in this episode, this is caused by a (hopefully one-time) fluke in my recording software because of all the editing. If you listen at half volume on an iPod it isn't bad. Special thank you to Lionfayt, he stepped up and voiced Jake for this episode only even though he is on hiatus from voice acting. From the next episode on Jake will be voiced by James Adler. We all have Justin and Lionfayt to thank for the hillarious blooper reel after the story content in this episode, they were kind enough to let me mix their mistakes in and share them with everyone. An interview with Fan Fiction writer: ArkansanDragon will drop into the feed next week so look out for that. Special thanks to PhilMatu for teaching me the code to fix up Savetheshows.com, and its only going to get better! Description: Hey all, sorry for the late notice but we're hosting a rally for fans on savetheshows.com right now! You'll get news from the podcast, news from Save Disney shows, (our partner site) and plenty of words from fans of the AmDrag! Description: Well it's finally here kiddies. I finally got the time to edit some bits from the Live rally on the 24th together. Most of the rally actually took place in text chat an can be viewed in a PDF in the post above. The topics in this podcast are kind of scattered thanks to some very...creative...editing on my part. So I'll outline the basics of it here. The last 15 minutes are filled with an actual voice conference held during the Rally with those of us who managed to get in Voice chat. Enjoy. Description: As promised here is the PDF containing the rally text chat...see the episode below for more. Description: Hi all, long time no cast! I would like to take a second to quickly apologize for the horrible lack of episodes we've been experiencing since the synopsis dropped nearly a month ago. We are not trying to be a pod-fader (podcaster who doesn't post regularily) it's just happening due to the difficulty of running a show with 10 actors. Everyone is now cast and most of our actors have sent in the lines for the first episode. We'd intended to drop a special short fan fiction in celebration of Save Jake WEEK yesterday, that will still happen We have one more actor we need lines from for that one and then you will all recieve your just rewards for a hard week of contacting Disney! Description: I know some people just don't like to listen to one guy talk about a show for 20 minutes (and yes I know my voice was being a little difficult at the time), so for those people we've dropped this PDF of the synopsis. It was originally written to help with the reading, and is not entirely written in propper writing convention, but is readable. This is the same synopsis read in Thursdays episode minus the extra talk at the end. I hope this helps everyone get caught up in the story. See you all in 3 weeks! Well it's Finally here and with time to spare! The American Dragon Jake Long Synopsis episode. This will get all first-time ADJL fans a taste of this great series and why we are trying to save it, but there is also something in it for long time fans! After the synopsis Mike talks about what they've been up to getting the show ready as well as introducing the first book. Description: In preparation for tomorrows premiere we've decided to release our first promo for the show. If you are a podcaster and want to share the love you can download the promo and play it for your listeners (but make sure you tell us so we can do the same for you). Otherwise I hope everyone enjoys our promo and We'll see ya tommorrow! 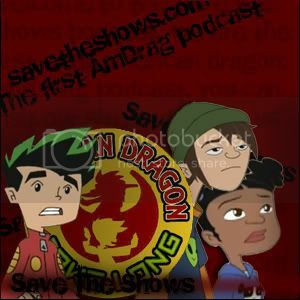 Description: Ladies and gentlemen, it has been announced that barring any unforeseen circumstances the first episode of Save The Shows: American Dragon Jake Long series will air on June 10th 2007! The same day as the Save Disney Shows organization is holding Save Jake Day III. What a kickoff! But that's not all, there must be a reason for this post right? Right! It's time to bust out your cell phones with free nights and weekends and call (206) 350-6931 . From there long-time ADJL fans can leave messages to help with the recap and newcomers can just leave messages. These calls will be played on the recap episode! Don't have a cell phone? email your recap help to savetheshows@gmail.com with the subject "recap" and we'll read it on the show! Beyond that, those of you who like to subscribe in things like iTunes pleasantly surprised in the next few days. Save The Shows is going on iTunes as well as a few new updates! That's it for now! I'll see you all in 2 days! Description: Welcome to the Save The Shows Blog! This is where the magic happens, err...Will happen. Expect more from this blog in the near future but just to make sure you don't miss a beat of info I highly recommend that you subscribe to the feed now with your favorite podcatcher (e.g. iTunes, Yahoo, PodAmigo, etc.). That's it for me for now, see ya next time!